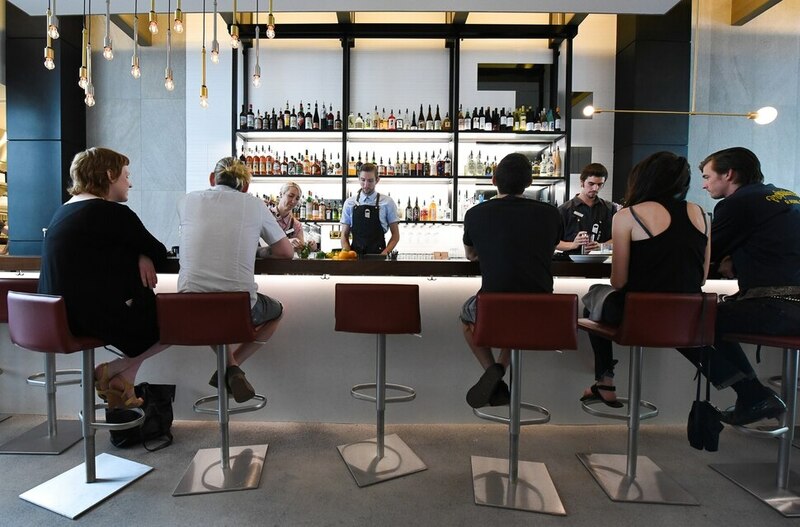 (Francisco Kjolseth | The Salt Lake Tribune) Post Office Place, a new bar by the same owners as Takashi next door, welcomes patrons on Tuesday, June 19, 2018. One of the main reasons Takashi and Tamara Gibo opened this downtown watering hole is so that patrons could have a drink while waiting for a seat at Takashi, where the wait can sometimes be an hour long and liquor laws don't allow cocktails unless you are seated. Takashi has, after three years, opened Post Office Place, a new bar next to the popular sushi restaurant in downtown Salt Lake City. This is good news for anyone who has waited, and waited, and waited for a table at Takashi — and subsequently cursed Utah liquor laws, which prevent restaurant guests from ordering a cocktail before being seated at a table. ”We opened it because we wanted it to be a place where people can wait while they are waiting [for a seat] at Takashi,” explained Tamara Gibo, who, along with husband Takashi, owns the restaurant. (Francisco Kjolseth | The Salt Lake Tribune) Ceviche Mixto at the Post Office Place, a new bar by the same owners as Takashi, located next door, welcomes patrons on Tuesday, June 19, 2018. One of the main reasons Takashi and Tamara Gibo opened this downtown watering hole is so that their patrons could have a drink while waiting for a seat at Takashi where the wait can sometimes be an hour long and liquor laws don't allow cocktails unless you are seated. (Francisco Kjolseth | The Salt Lake Tribune) Bartender Crystal Daniels prepares drinks at the Post Office Place, a new bar by the same owners as Takashi, located next door, welcomes patrons on Tuesday, June 19, 2018. (Francisco Kjolseth | The Salt Lake Tribune) Post Office Place, a new bar by the same owners as Takashi, located next door, welcomes patrons on Tuesday, June 19, 2018. One of the main reasons Takashi and Tamara Gibo opened this downtown watering hole is so that their patrons could have a drink while waiting for a seat at Takashi where the wait can sometimes be an hour long and liquor laws don't allow cocktails unless you are seated. (Francisco Kjolseth | The Salt Lake Tribune) Host Carmen Walker awaits patrons at Post Office Place, a new bar by the same owners as Takashi, located next door, on Tuesday, June 19, 2018. The new establishment features original art by Gary Vlasic, at right, and vintage P.O. Boxes. (Francisco Kjolseth | The Salt Lake Tribune) Post Office Place, a new bar by the same owners as Takashi, located next door, welcomes patrons on Tuesday, June 19, 2018. One of the main reasons Takashi and Tamara Gibo opened this downtown watering hole is so that their patrons could have a drink while waiting for a seat at Takashi where the wait can sometimes be an hour long and liquor laws don't allow cocktails unless you are seated. (Francisco Kjolseth | The Salt Lake Tribune) Haru Maki al Pollo, made with chicken, ahi de gallina, walnut and slaw at the Post Office Place, a new bar by the same owners as Takashi, located next door, where they welcomed patrons on Tuesday, June 19, 2018. (Francisco Kjolseth | The Salt Lake Tribune) Beef Tartare at the Post Office Place, a new bar by the same owners as Takashi, located next door, welcomes patrons on Tuesday, June 19, 2018. One of the main reasons Takashi and Tamara Gibo opened this downtown watering hole is so that their patrons could have a drink while waiting for a seat at Takashi where the wait can sometimes be an hour long and liquor laws don't allow cocktails unless you are seated. (Francisco Kjolseth | The Salt Lake Tribune) Hamachi Ceviche at the Post Office Place, a new bar by the same owners as Takashi, located next door, welcomes patrons on Tuesday, June 19, 2018. One of the main reasons Takashi and Tamara Gibo opened this downtown watering hole is so that their patrons could have a drink while waiting for a seat at Takashi where the wait can sometimes be an hour long and liquor laws don't allow cocktails unless you are seated. (Francisco Kjolseth | The Salt Lake Tribune) Post Office Place, a new bar by the same owners as Takashi, located next door, welcomes patrons on Tuesday, June 19, 2018 with a menu that can be used as a post card. One of the main reasons Takashi and Tamara Gibo opened this downtown watering hole is so that their patrons could have a drink while waiting for a seat at Takashi where the wait can sometimes be an hour long and liquor laws don't allow cocktails unless you are seated. (Francisco Kjolseth | The Salt Lake Tribune) Post Office Place, a new bar by the same owners as Takashi, located next door, welcomes patrons on Tuesday, June 19, 2018. An extensive liquor selection features numerous Japanese spirits named Shochu and Japanese whiskey and pisco. (Francisco Kjolseth | The Salt Lake Tribune) Bartender Crystal Daniels prepares a Nikkei Sour with barsol pisco, ponzu, lime, egg white, chuncho bitters and served inside a cedar box at the Post Office Place, a new bar by the same owners as Takashi, located next door, welcomes patrons on Tuesday, June 19, 2018. (Francisco Kjolseth | The Salt Lake Tribune) Ethan Conner whips up drinks for patrons at Post Office Place, a new bar by the same owners as Takashi, located next door, on Tuesday, June 19, 2018. One of the main reasons Takashi and Tamara Gibo opened this downtown watering hole is so that their patrons could have a drink while waiting for a seat at Takashi where the wait can sometimes be an hour long and liquor laws don't allow cocktails unless you are seated. 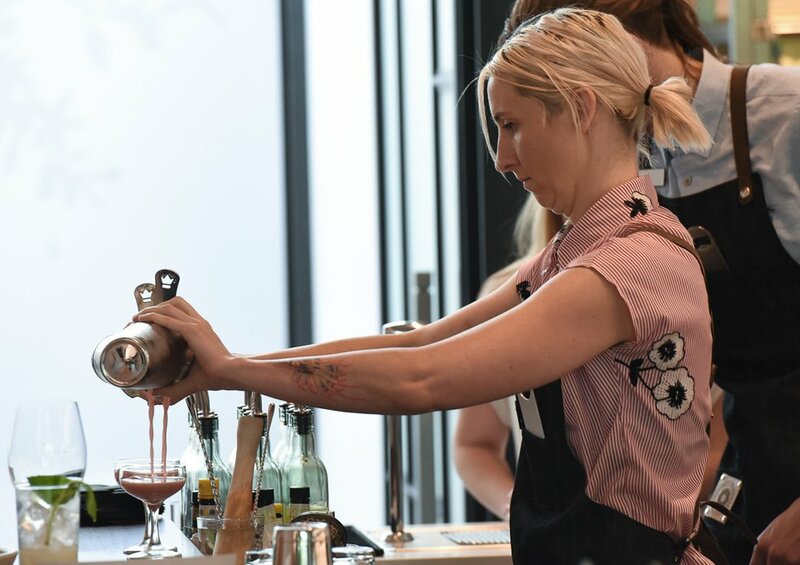 (Francisco Kjolseth | The Salt Lake Tribune) Bartender Crystal Daniels prepares drinks at the Post Office Place, a new bar by the same owners as Takashi, located next door, welcomes patrons on Tuesday, June 19, 2018. (Francisco Kjolseth | The Salt Lake Tribune) Post Office Place, a new bar by the same owners as Takashi, located next door, welcomes patrons on Tuesday, June 19, 2018. One of the main reasons Takashi and Tamara Gibo opened this downtown watering hole is so that their patrons could have a drink while waiting for a seat at Takashi where the wait can sometimes be an hour long and liquor laws don't allow cocktails unless you are seated. (Francisco Kjolseth | The Salt Lake Tribune) Post Office Place, a new bar by the same owners as Takashi, located next door, welcomes patrons on Tuesday, June 19, 2018. One of the main reasons Takashi and Tamara Gibo opened this downtown watering hole is so that their patrons could have a drink while waiting for a seat at Takashi where the wait can sometimes be an hour long and liquor laws don't allow cocktails unless you are seated. (Francisco Kjolseth | The Salt Lake Tribune) New Zealand Salmon Tiradito at the Post Office Place, a new bar by the same owners as Takashi, located next door, welcomes patrons on Tuesday, June 19, 2018. One of the main reasons Takashi and Tamara Gibo opened this downtown watering hole is so that their patrons could have a drink while waiting for a seat at Takashi where the wait can sometimes be an hour long and liquor laws don't allow cocktails unless you are seated. (Francisco Kjolseth | The Salt Lake Tribune) The 'Dark Crysal,' made with rye whiskey, turkish rhubarb, activated charcoal and lime is the creation bartender Crystal Daniels who is a fan of the 1982 film The Dark Crystal by Jim Henson at the Post Office Place, a new bar by the same owners as Takashi, located next door. (Francisco Kjolseth | The Salt Lake Tribune) Bartender Crystal Daniels puts the finishing touches on a Nikkei Sour with barsol pisco, ponzu, lime, egg white, chuncho bitters and served inside a cedar box at the Post Office Place, a new bar by the same owners as Takashi, located next door, welcomes patrons on Tuesday, June 19, 2018. Post Office Place, at 16 W. Market St., is sleek and modern. Its name and menu pay homage to the old post office that once stood across the street. “The post office is where cultures collided,” Gibo said of the fusion menu that leans Peruvian but has Asian influences. 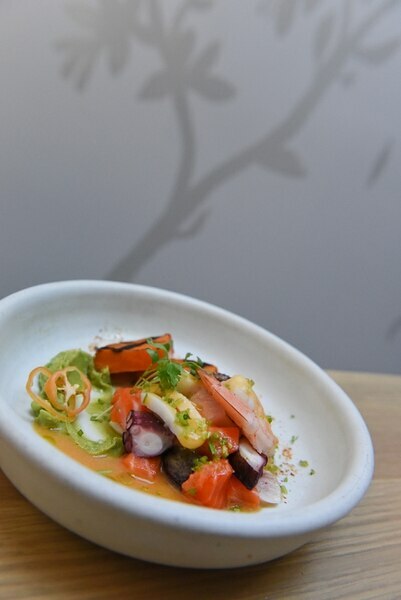 The small plates are “light and clean,” she said, and designed to whet your appetite before a full Takashi meal. Look for items such as ceviche, shrimp chowder made with broth (not cream) and, in true fusion fashion, a Peruvian empanada made with an Asian egg roll wrapper. 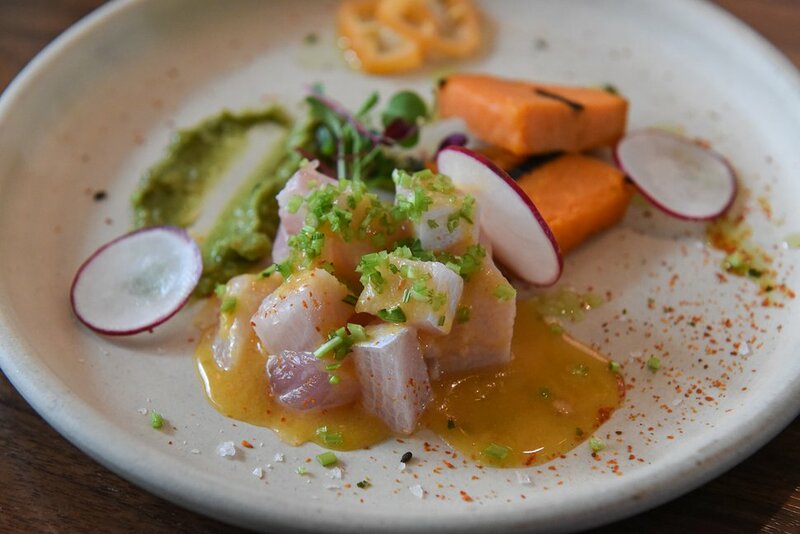 (Francisco Kjolseth | The Salt Lake Tribune) Hamachi Ceviche at the Post Office Place, a new bar by the same owners as Takashi next door, on Tuesday, June 19, 2018. One of the main reasons Takashi and Tamara Gibo opened this downtown watering hole is so patrons could have a drink while waiting for a seat at Takashi, where the wait can sometimes be an hour long and liquor laws don't allow cocktails unless you are seated. Naturally, guests don’t have to be on the waiting list at Takashi to visit Post Office Place, Gibo said. They can visit any day, except Sunday, from 4:30 p.m. to 1 a.m.
Post Office Place has been three years in the making. In 2015, the owners applied for a dining club license from the Utah Department of Alcoholic Beverage Control. Back then, business owners were waiting almost a year for the designation. Then, in 2017, the Gibos pulled their DABC application because the Utah Legislature did away with dining clubs, which offered a hybrid between a bar and a restaurant. Today, businesses that have the dining club license have until July 1 to decide whether they want to switch to a bar license, which allows only those 21 and older on the premises, or a restaurant liquor license, which requires some sort of barrier preventing minors from sitting too close to the pouring and mixing of alcoholic drinks. In restaurants, people also are required to order food with their drinks. Post Office Place also endured usual construction delays — and, on top of that, the Gibos needed time to plan their daughter’s wedding. (Francisco Kjolseth | The Salt Lake Tribune) Bartender Crystal Daniels prepares drinks at the Post Office Place, a new bar by the same owners as Takashi next door, on Tuesday, June 19, 2018. With the opening of Post Office Place, the owners are considering a remodel of Takashi itself. That presents another set of liquor-law dilemmas for the tiny restaurant. Takashi did not have the 7-foot barrier — aka Zion Curtain — because it was grandfathered under the old law, Gibo said. If it decides to remodel, it will fall under a new liquor statue that requires restaurants to have a 10-foot barrier where minors cannot be seated. Once again, customers will be waiting to see how that project plays out. Until then, you can probably find them in the Post Office Place bar having a drink.